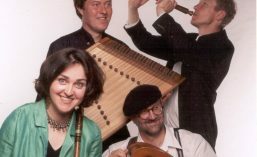 Since their formation in 1992 Sirinu has enjoyed a reputation for lively and entertaining performances of early music. In their programmes they seek out historically interesting musical moments and make connections with other musical cultures and musicians. They have made over twenty recordings of music ranging from medieval cantigas to music from the stuart courts. The group takes its name from the Andean word for the treacherous water spirits who both inspire and ensnare mortals with the music of their springs and waterfalls. In European mythology, the same universal idea surfaces in the tale of the Sirens, who lure sailors to their doom by the beauty of their singing. Sirinu was adopted by the group as a symbol of the convergence of the different myths and musics from both the Old World and the New Worlds that characterise the Renaissance and Medieval periods in which Sirinu specialise. Sirinu has toured for the British Early Music Network, for the British Council in South America, Africa and Europe and for early music networks and festivals in Europe. Sirinu has broadcast many times for the BBC in a variety of historical programmes. They broadcast their own four-part series ‘The Road to Toledo’ as well as performing on‘In Tune”, ‘The Early Music Show’, ‘Music Restored’ and live from festivals in Beverley and York.